Chester L. Brighton was born April 23, 1916, in Leland, Iowa, to James and Rose Brighton. Whenever farm chores permitted, he enjoyed baseball with his 12 siblings and nearby neighbors. Mr. Brighton left home at a young age to work in the Civilian Conservation Corps. USS Helena (CL50). 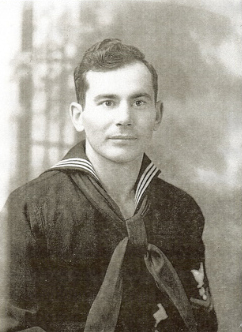 Petty Officer Brighton was aboard the Helena when she was torpedoed during the Japanese attack on Pearl Harbor. He was among the damage control crews that restored power to the gun batteries so the Helena could fight off the attack. After repairs stateside, the Helena returned to the Pacific theatre to participate in the battle of Guadalcanal in the Solomon Islands where she sank four Japanese heavy ships. At the battle of Kula Gulf, while providing support for a night landing of Marines, the Helena, hit by three torpedoes, began to sink. Mr. Brighton went over the side with the remaining survivors. At daybreak, he was the last man rescued by a destroyer. He also served onboard the USS Sierra (AD18), USS Twining (DD540) and the USS Jason (AR8). Chief Brighton was a member of the fire department at Naval Air Station Miramar and trained recruits at Naval Training Center San Diego. His platoons won many awards for excellence. After retirement in 1960, Chief Brighton worked at National Steel and Shipbuilding Company in San Diego where he supervised construction crews. Until his death in 1990, Chester resided in La Mesa, CA, with his wife of 48 years Inez (McKenzie). He has two children: twins, Catherine, married to Hugh Yarbrough, and Carleton, married to Jean (Heim). He has two grandsons Todd and Kevin Brighton and four granddaughters, Julie Brighton, Cynthia (Yarbrough) Sieradski, Cheryl (Yarbrough) Hammel, and Caryn (Yarbrough) Staib. Chester has four great grandsons: Chase and Trey Sieradski, and Dayton and Blake Hammel.